I found this article by Brian Walker, reproduced below, about the neglect of the implications of Brexit for Northern Ireland to be particularly interesting. Although Mrs May promised “no return to the border of the past”, her Brexit Secretary admits he has no idea how this can be achieved. Meanwhile Sinn Fein is finding participation in power sharing, in a time of limited resources, too difficult. It prefers street politics to responsibility. There is a lot of happy talk about “a united Ireland”, with no discussion of what that would mean for the rest of the country in terms of tax increases, expenditure cuts, reduced social cohesion, and increased spending on security. I am afraid many on my side of the border give as little thought to to the real complexities of governing Northern Ireland, as many UK voters gave to what Brexit would mean for Ireland, on 23 June 2016. Northern Ireland has been on the sidelines of the UK general election campaign, despite continuing political deadlock and the major unresolved questions resulting from Brexit. Brian Walker suggests that this reflects a general disengagement with Northern Ireland from the May government, which has taken the view that the North’s political issues are for their politicians to sort out. The Irish government can now be said to be pursuing Northern Ireland’s interests more actively. Northern Ireland is accustomed to being tucked away on the sidelines of a UK general election. While it is part of the constitutional nation, it is barely part of the political nation, if that is defined by electing members of the UK government. (Scotland look out!). Its electoral cycle and political interests can fundamentally clash with those of the government at Westminster. ‘Westminster will always put its own interests first, even if ours are about life and death’, is a familiar refrain. The snap 1974 ‘Who Governs Britain’ general election did for the first fragile power sharing Executive within weeks of its formation when voters returned a full house of MPs bent on bringing it down. Power sharing did not return for a quarter of a century. Power sharing suddenly collapsed in the New Year under the impact of the Remain referendum result locally, which put the minority coalition partner Sinn Fein on the winning side and provided them with a test run for a bigger challenge. Devolved government remains in limbo, at least until after the snap general election on 8th June. In Ireland many nationalists rate Brexit as creating the biggest crisis since partition almost a century ago. Unionists and the British government are more circumspect. Before the EU referendum, the Assembly had seemed to be going quite well. It had survived two terms with deadlocks but avoided collapse. Nationalists seemed broadly content with the constitutional status quo. The Sinn Féin vote had dipped and the DUP were comfortably ahead by ten out of 108 seats. A Fresh Start agreement brokered by the British and Irish governments at the end of 2015 ended a deadlock over welfare cuts that had lasted a year. It even led to behind the scenes talks between the DUP and Sinn Féin to settle a new style budget, as they campaigned for the Assembly election of 2016. But the combination of a regional Remain majority, a bitter row over holding the DUP First Minster Arlene Foster responsible for a botched renewables heating scheme and the fatal illness of deputy First Minister Martin McGuinness created enough combustible material for Sinn Féin to pull out of the Assembly early this year, obliging the British government to call another election. The campaign unleashed a flood of resentment at what republicans regarded as DUP majoritarian behaviour and lack of respect for Irish culture. In particular, they pointed to the failure of unionists and the British government to implement totemic equality measures like the Northern Ireland Bill of Rights provided for in the Good Friday Agreement and the Irish Language Act provided for in the St Andrew’s Agreement. Unionists as usual saw Sinn Féin as exaggerating minor grievances to advance the republican cause but were thrown on the defensive over resisting Sinn Féin’s demand for Foster to be suspended from office. A nationalist ‘surge’ in turnout in the Assembly election that followed in March, bluntly to ‘stick it to Arlene Foster’, brought Sinn Féin within two seats of replacing her as First Minister, as the overall nationalist result overturned the unionist bloc majority for the first time. The Sinn Féin boycott won the endorsement of their voters. Northern Ireland had turned a chapter. The Westminster election on 8 June will be another sectarian contest to gain advantage in the existential question of Irish unity, ahead of the interparty talks on the Assembly’s future which it is hoped will resume immediately afterwards. The political scene – changing utterly? There are profound doubts that the talks can succeed anytime soon. It remains a sticking point for Sinn Féin for Foster not to return to office until a public inquiry rules on her conduct in about a year’s time. Moreover, when the prospect of a hard border began to emerge, Sinn Féin quickly saw the political possibilities. A re-erected border would not only be a throwback to an unlamented past; it offers a potential new route to a united Ireland. Perhaps the time has come for Sinn Féin to abandon the frustrations of power sharing in a coalition of opposites, and build on the nationalist-dominated Remain majority to create momentum for a united Ireland within the EU, launched by a border poll, followed if necessary by another poll in seven years time as the Good Friday Agreement permits? The May government’s response to the Assembly breakdown is strikingly different from the close involvement of the Blair years, when peace through paramilitary disarmament and disbandment was the main objective. Without such a big issue to compel her attention, Theresa May has followed the Cameron precedent and has remained immune to appeals from local politicians and civil society to intervene personally. ‘Leave it to themselves to sort out’ is the mantra. This UK government displays less sensitivity to the Northern Ireland implications of key policy issues than the old days of the peace process. For instance, motivated it would seem by the Prime Minister’s frustrations over deporting Abu Qatada and a visceral dislike of European courts, the Conservative manifesto looks forward to a review of the Human Rights Act when the Brexit process has concluded, even though the HRA is entrenched in the Good Friday Agreement and any change is strongly opposed by Northern nationalists and her Irish government partners. May’s former junior minister at the Home Office, Northern Ireland Secretary James Brokenshire, paid more attention to his party than his ministerial interests when he spoke out in favour of halting prosecutions of soldiers for actions long ago, giving support to a Conservative backbench campaign first sparked by what happened in Iraq and Afghanistan rather than Northern Ireland. It therefore came as no surprise to local opinion when Sinn Féin rejected him as a mediator in interparty talks to get the Assembly going again. Brokenshire has remained on the sidelines, his role largely limited to extending time limits for the fitful and so far unproductive talks without an active chair, an agreed agenda or any obvious sense of direction. His main leverage is to threaten another Assembly election in what would be Northern Ireland voters’ twelfth trip to the polls since the Westminster election of 2010. In fact creeping direct rule restored by primary legislation is the more likely option if the talks drag on much beyond the summer Orange marching season. To her critics May is over-identifying her successful management of the Conservative Party with British national interest. She is uniting the Conservatives around a ‘hard Brexit’ to see off the challenge of UKIP in England and the threat of Scottish independence from the SNP. As she has no real party interest to guide her she has a tin ear for Northern Ireland. But by identifying withdrawal from the EU on hard Brexit terms with a stronger United Kingdom so closely, she may be increasing the longer term threat to its survival. With some cause no doubt, she distrusts the devolved governments where nationalists are in power, although she is careful not to slap down Sinn Féin. A  proper reluctance to takes sides against Sinn Féin’s revived pressure for Irish unity may be one reason why she has not intervened meaningfully in the Assembly stand-off. But it contrasts with her refusal to authorise a second Scottish referendum on independence even after a vote in favour of it in the Scottish Parliament. On Brexit May rejected nationalist arguments that the Remain votes in Scotland and Northern Ireland gave them the mandate to pursue different courses from England and Wales. The case to remain in the single market and the customs union pressed by nationalists in Scotland and both parts of Ireland was rejected without a public dialogue before the Article 50 withdrawal terms were published. As endorsed by the Supreme Court in the Miller judgment, negotiating EU withdrawal is a reserved matter for Westminster, full stop. The Sewel convention was brushed aside as easily as the Fixed-term Parliaments Act. If May’s government seems to have reverted to the character of a centralised unitary state, it has also increased the stakes in the next battles over the future of the UK. The Irish see Brexit as bad for Ireland and bad for Britain, an aberration of English nationalism. Because of the land border with the EU, Northern Ireland will be the UK region most adversely affected by the immediate impact of Brexit and the long term effects on the Republic may be greater than on the UK, hitting £60 billion a year two-way trading. Agribusiness and the energy market are substantially integrated. More than 40 per cent of Irish agri-food and drink exports go to the UK market, compared with 31 per cent to the rest of the EU. Fifty-two per cent of Northern Ireland exports go to the EU, including 38 per cent to the Republic of Ireland. Eighty-seven per cent of farm income in Northern Ireland comes from EU. The Irish greatly fear a British policy of cheap food imports that would shut off their farm exports. As Brexit negotiations begin later in June, the British strategy remains opaque while the EU is pledging transparency. Now that the initiative has shifted to the EU, the Irish government has embraced the interests of Northern Ireland on the grounds that the whole island is crucially affected. While this has ruffled feathers on the Conservative right, the British government is ‘relaxed’. In his swansong as Taoiseach, Enda Kenny made two important gains with his EU colleagues. After settling EU citizen rights and free movement and the cost of Britain’s ‘divorce bill’, he secured third place in the EU’s order of negotiating priorities for avoiding a hard Irish border, a factor ‘of paramount importance… to protect the peace and reconciliation process’. Then at the EU summit in May, following the precedent of a united Germany, the leaders agreed a declaration that ‘the entire territory’ of a united Ireland would be part of the EU in the event of a successful future referendum on unity, allowing Northern Ireland to automatically rejoin the EU. The Irish are at pains to point out that this in no way undermines the constitutional guarantees of the Good Friday Agreement and that they are opposed to holding a border poll in the foreseeable future. The ideal for both governments is to leave things as much as possible as they are, including open trade and common citizenship through the British Isles. The Irish will argue for a Brexit transition period of at least two years, which they hope will extend indefinitely. 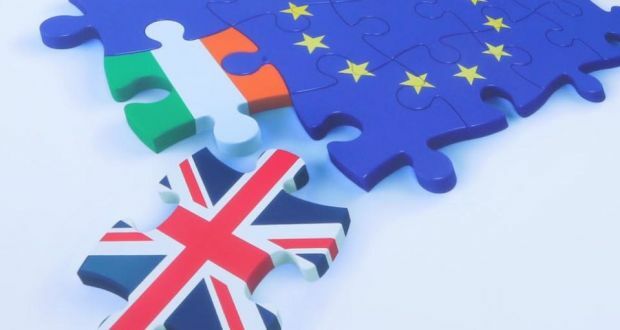 The Irish analysis of economic relationships concludes that if continuing membership of the single market and the customs is excluded by the British the EU should offer ‘special status’ for the North, as close to single market membership it as possible. Nobody believes this can be done without custom checks to prevent illegal third country trading in both directions. The Irish are working independently on solutions a few miles south of the actual border on the Dublin-Belfast motorway. These would involve joint EU/Irish-British paperwork, electronically monitored self assessment by the big carriers, and rare spot checks for motorists no more intrusive on the main route that the toll booths further south. However, there are hundreds of other routes to be considered. The British are sceptical about achieving a special deal for Ireland anytime soon. As the Brexit secretary David Davis has pointed out: ‘How on earth do you resolve the issue of the border with Northern Ireland and the Republic of Ireland unless you know what our general borders policy is, what the customs agreement is, what our trade agreement is. It’s wholly illogical’. To be fair, the Irish are privately every bit as sceptical. The Irish argue that the EU treaties underpin the entire Good Friday Agreement. Under the GFA everyone in the North can opt for Irish and therefore continuing EU citizenship. EU citizens could therefore be marooned in alien territory. The Irish are concerned that their rights cannot be guaranteed without the jurisdiction of the European Court of Justice. The British demur: most problems have their solutions in existing bilateral arrangements such as the common travel area. In all of this the British are essentially bystanders at this stage. The Conservative manifesto pins faith on achieving ‘a deep and special partnership including a comprehensive free trade and customs agreement’. Apart from the obsession with identity politics, other old realities remain. For all the concerns about the north-south integration of agribusiness, energy and tourism, the British market for Northern Ireland is around seventeen times greater than the Irish market. Faced with the prospect of unity, Ireland would balk at replacing the £10billion annual subvention from Westminster. But in one key area, the Irish could prove more effective than the British. With the election of a new Taoiseach to head the minority coalition, a general election in the Republic cannot for long be delayed. Both main governing parties, Fine Gael currently and a reviving Fianna Faíl, have it in their power to state terms to Sinn Féin that their eligibility to join a future coalition in the Republic would depend on their returning to the Assembly in the North. While the Conservative manifesto makes the remarkable admission (no doubt with Scotland mainly in mind) that the UK government ‘has in the past tended to devolve and forget’, followed by ‘we will put that right’, the British have no comparable leverage. Whatever the outcome of the EU withdrawal negotiations, the balance of power over Northern Ireland has shifted a little towards Dublin. Brian Walker is an Honorary Senior Research Fellow and media adviser at the Constitution Unit. He is a former political editor for BBC Northern Ireland. On your final paragraph, Northern Ireland accounts for about 2.5% of the UK population. Prior to the GFA most of the UK mainland population were weary of the decades of expense and bloodshed arising from the province, but would probably have reluctantly stuck with it had not the Major and Blair Governments decided (through a combination of American pressure, a desire to cut military spending and, in the Blair case, vanity) that the deal with terrorists that had been for so long resisted was really quite OK after all. One of the consequences of that is that in the British mainland electorate even reluctant support for Northern Ireland remaining part of the UK has pretty much evaporated. Small wonder then that it did not loom large in their thinking on Brexit. On the other hand, Northern Ireland has about 27% of the population of the island of Ireland. A much more pressing reason, it might be thought, for serious consideration.